The Good, the Bad, and Godzilla 続・夕陽の呉爾羅: 31 DAYS OF HALLOWEEN: BOB WILKINS LIVES! "Well, At Least We Ran the Right Movie..."
Comments, news and opinion by August Ragone, "Rondo Hatton Classic Horror Film Award" winning author of "Eiji Tsuburaya: Master of Monsters", host of Shout! Factory TV's "Kaiju Movie Marathon" & "Super Sentai Spectacular", and the guest host of KOFY-20's "Famous Monsters TV"
31 DAYS OF HALLOWEEN: BOB WILKINS LIVES! 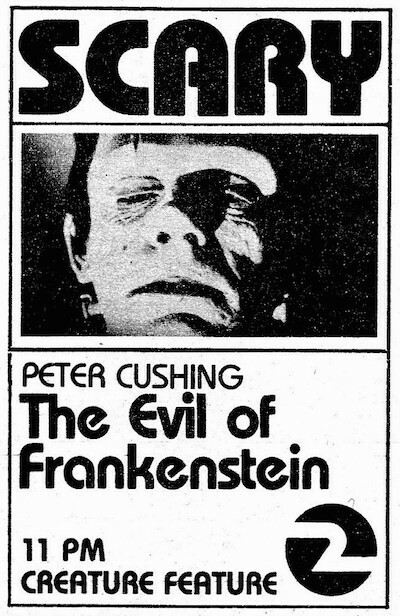 "Well, At Least We Ran the Right Movie..."
The TV Guide ads were sometimes a little wrong... March 18, 1978. Read more about Bob Wilkins and "Creature Features", here — and don't forget to visit the official Bob Wilkins website! Two-time Rondo Award-winning author of EIJI TSUBURAYA: MASTER OF MONSTERS. August has commented on Japanese film and popular culture on radio, television, in print, online, and at events for more than three decades. As a teen, he served as Horror Host Bob Wilkins' "Japanese Film" & "Godzilla Expert" at KTVU TV-2. And has lectured at Lucasfilm. He has contributed liner notes for numerous DVD releases, edited and authored over 150 subtitle scripts, and written for periodicals such as Japanese Fantasy Film Journal, Filmfax. Video Watchdog, Asian Cult Cinema, Henshin! Online, Oriental Cinema, G-Fan, Super7, Otaku USA, and Famous Monsters of Filmland. As an events promoter, the San Francisco-born native hosted the "Japanese Fantasy Film Faire" (1979), the first Anime & Tokusatsu event outside of Japan, and has gone on to produce live music and multi-media events including The Sleazefest, Incredibly Strange Wrestling, The Greaseball, Godzillafest, and Shock It To Me!. GBG IS A MULTI-RONDO NOMINEE! NEW PAPERBACK EDITION AVAILABLE MAY 6, 2014! •On-screen Liner Notes, Character Profiles, Song Lyrics & more! CLICK TO READ CHAPTER 1 NOW! Giant Monsters on the Loose! Huffing Bullmark Vinyl Since 1973! You may send your complaints to august[.]ragone[@]gmail[. ]com which will be forwarded to the great entrepreneur, Mr. Kumayama of Happy Enterprises. Thank You!